This dish is a nice spring time meal. It's quick, easy, and full of flavor. I've been craving fruit, especially tropical fruits, so this pineapple dish hit the spot for me. I've been trying to cook as much as possible lately, though it's difficult. I've entered the third trimester with twins and it's getting increasingly difficult to do even the most basic things like stand for more than 10 minutes, breathe, bend, sit, and so on. Mostly I just want someone else to cook for me, but that's not always an option! I'm going to try to get a few things in the freezer over the next couple of weeks to have on hand for quick meals once the babies arrive. They will be coming right in the heat of summer, so I'm not sure what to make -- any suggestions? It's not really prime casserole or soup season then, which are the easiest things to put in the freezer sometimes. This dish will make about 4 servings when served with a side of rice or couscous. It's a nice weeknight dish that comes together pretty quickly and makes some lunch leftovers for the next day (my favorite). I was super excited to have my food blogger friend Sarah's blog this month for the Secret Recipe Club. And it just so happens that she had mine last month! I've been following her blog The Pajama Chef for a few years now and always enjoy reading it. Sarah lives in Nashville with her husband, kitties, and a new adorable baby I just saw on Instagram. While browsing through Sarah's recipes I saw many that I wanted to try (mango coconut granola, rhubarb muffins, and crock pot honey sesame chicken, just to name a few) some that I've tried in the past like these amazing Apple Fritters. 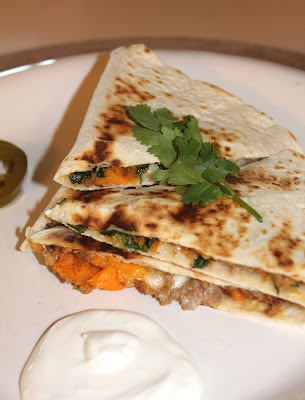 I ended up choosing these Sweet Potato Pork Quesadillas for a Cinco de Mayo meal. I loved the combination of sweet and spicy and my husband gave these a big thumbs up! Pregnancy has made me want spicy food more often lately - and has given me the ability to tolerate and enjoy higher levels of heat than normally. So, I piled on the pickled jalapenos on mine. Below is my slightly modified version of the recipe. This recipe made 4 quesadillas, and will serve about two people for a main dish.